If you want to make your landscape look unique and attractive, you will need much more than just plants, trees and lawns. It’s why property owners add various outdoor features and decorative elements. One more way of adding the attraction quotient to your property, is to hire the services of a company that provides services to design and install water features. We at Scapes and Stones are a company that has been in this business for a number of years. We know what it takes to provide customers with the kind of services they need at water feature cost that fits perfectly into their budget. Over the years, we have catered to customers throughout greater Las Vegas, NV and surrounds. Fountains - This is a very popular feature and in most instances, this installation becomes the focal point of your landscapes and the design and placement of the rest of the features are then centered on this. 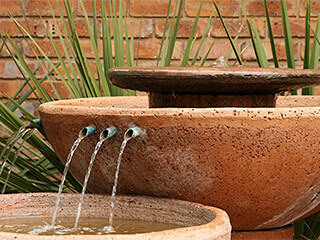 In some cases, clients may want more than one stone fountain and we can provide those solutions to. 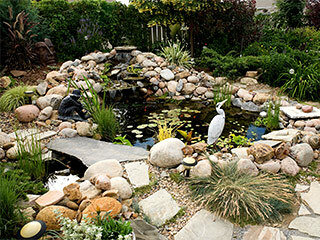 Ponds - Many property owners like to have more natural-looking water features and ponds are an excellent installation for these spaces. We can construct these in different styles including Mediterranean, Zen, and Tropical etc. We will ensure that the design of these features is in-line with the design of the rest of the landscaping. You can also opt for a Koi Pond if you like and the placement of this element will have to be planned with care; this is because the fish and aquatic plants need a certain amount of shade to remain healthy. Waterfalls - These are another very popular feature that lends a unique look to the landscaping. We can design and install the type of natural rock waterfall you need. Some of our customers are worried about the safety factor as waterfalls have ponds at the base of the installations. However, we have a solution for that too. We can provide a pondless waterfall. As the name suggests, this waterfall doesn’t have a pond at the base and is the ideal option for homes that have kids and pets. Regardless of the type of water feature/s you want, when you come to us with your requirement, you are assured of high quality solutions that are right in line with your requirements. Speak with the Scapes and Stones experts at this number 702-278-3228 and give us some more details about your project. You can also contact us through our online form and we will respond shortly.